What it is with Danish bands and perfect hair? As with The Children and Walkers, Speers sport perfectly groomed barnets. What of the contents? 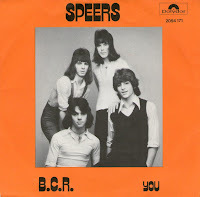 Well B.C.R is a rampant and crunchy ode to The Bay City Rollers no less. In fact it is probably one of the best Roller tributes, it certainly is the fuzziest and rockiest of the bunch. Lyric-wise who knows? If there are any Danes watching, a translation of the lyrics would be most welcome. Another great tune. Thanks, Robin! hahaha, the one on the guitar, is my father! Hello- I am the singer on this record. I am the guy with the longest hair at the left side on the cover. Funny to see and hear an old record of ours suddenly appear this way.It would be a pleasure for me to translate it into english,comming up in a few days ! Just kidding off course, but after 30 years with short hair, I now have returned to the long look again. However it looks a little bit different, with a tiny twist off grey in it, than when we were "The Sweet Sixteens". 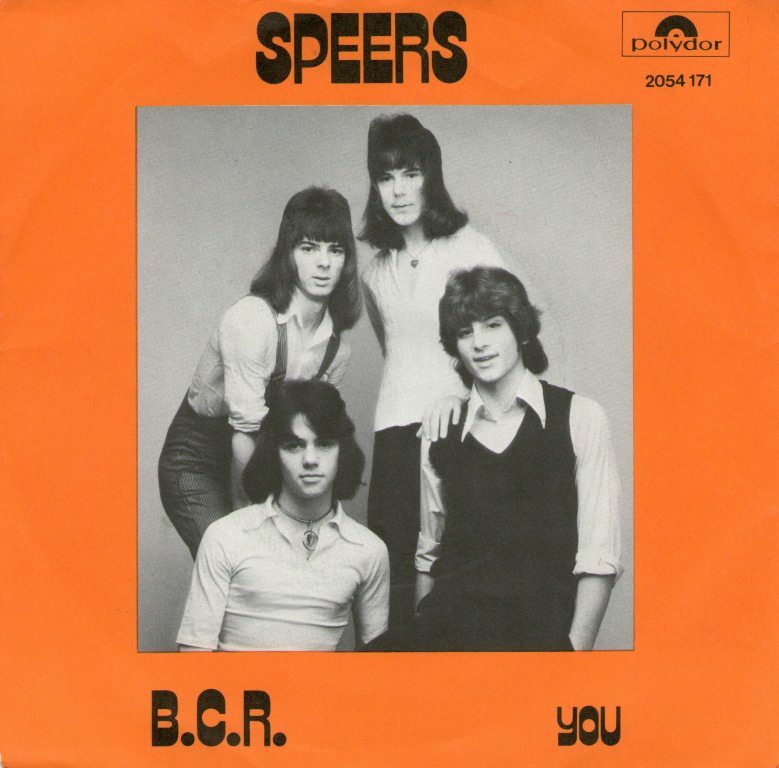 The song B.C.R. was originally an english song with lyrics in english just as you have it on the b-side of the record. The Big Bad Recordcompany Polygram forced us to make a Danish version, otherwise no publishing ! On the way home from the studio in the bus, we made this "Tribute" to Bay City Rollers, as a protest against being dictated to sing in Danish. Every Band in Denmark at that time dreamed about going "worldwide", so it was a big stroke for us. All the bands in that genre in Denmark tried to look like bands like Sweet, Bay City Rollers, Slade etc. The lyrics are very simple and the subject is, that all the girls are running after Bay City Rollers, so what about all us other poor guys ? B.C.R. can go worldwide and the dreams of 4 young guys with nice looking hair from Denmark finally comes through ! As the author of this "fantastic lyric" I've been taking me some editorial freedoms in the translation ! “Don’t you love me, I would rather love"
Oh, stay here with me, don’t ever go away, with…. If you'r unfaithfull, just watch me grab ! wow. I love the angle. So not a tribute but a snotty rebuke with attitude. Thanks so much for sharing. Did you guys record/release anything else? BTW -what's your first name? Today two of us is still into music, a third one is a world known magican, and the guitarplayer is head of an It-department in a big tranportation-company. Hello! Fantastic blog! I love it! Do you remeber what the starting bid was? And how much was it sold for in the shop? Ok, I found a mint ex here in Gothenburg today for 5 Sek (Less than 1 Euro). I´ve never seen it before...and your blog is the only place on internet I can find information about it. So I supose it´s quite rare? I like it though, so i guess i´ll keep it for a while! Thanx for info!